In a small bowl, whisk together mayonnaise, lemon juice, lemon zest, dill and salt and pepper. Stir in 1/4 cup of blue cheese crumbles, pressing with a fork to break down and larger pieces. Toast the bread until it’s golden brown. Spread the lemon dill mayo evenly on each slice of bread. 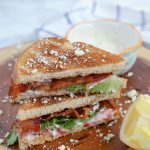 Assemble the sandwiches: Toasted bread with mayo, tomato, lettuce, and bacon. Top with another slice of toasted bread and sprinkle blue cheese on top. Secure with toothpicks, slice in half with a sharp knife and serve immediately.